In 'Busted,' a Chevy Volt owner in his bathrobe vents to a group of alien creatures in his garage that it's "the third time this week." That would be the third time this week their spaceship has landed in front of his house so they can marvel at the technology of the Chevy Volt parked in the garage. 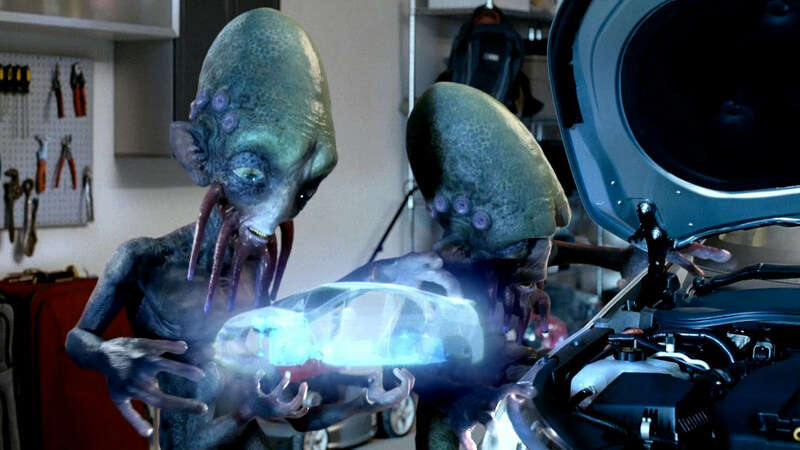 Full of classic cinematic charm, this Pre-game spot from Goodby Silverstein & Partners and directed by O Positive's Jim Jenkins, marries the car's key attributes to a funny narrative starring CG aliens designed and created by The Mill L.A.
"It was so fun to bring our unique species to life, with their own distinctive performances, personalities, look and feel," says Arielle Davis, our Head of Production. The creatures in "Busted" mill around the garage excitedly using their own technology to study Chevy's Volt, simply unable to grasp that it's electric. When the car's owner explains patiently, "It's electric, but when I need to go farther it uses gas," they still don't seem to get it. And when the owner asks them to please not tell anyone else about it, turns out he's too late. "Who told?" he asks, as a fleet of spaceships starts to land on the street behind him. "To make the creatures authentic meant really getting close to them, asking ourselves how do they move?" Davis explains. "What do they think? How do they feel? And how do we express that?" The VFX process began with concept design, modeling and creating variants-facial/body structure and color patterning/texturing, photo-real rendering and animation. The creatures were shot with clean plates using actors in the scene. Those performances that Jenkins directed on set were the basis for the CG creatures' performances. Our Lead 3D Artist/Lead Character Developer Jamie O'Hara says that nature references were the starting point-anatomy and animal reference-which evolved into the creatures' amphibious look. "Working closely with Goody, we developed the creatures-going through a lot of back-and-forth, adding extra limbs, taking away the mouths, adding them back, adding tentacles, etc.-all the while trying to keep them grounded in the 'believable' real world. You name it, I looked it up and down and added it here and there." "There was a lot of collaboration with Jim and the agency on every iteration of concept through to renders," Davis says. "We set up the job in several phases with Jamie O'Hara as Lead Concept Designer, Steve Beck as Lead Animator, Andre de Souza as Lead Lighter and Robert Sethi as overall VFX Supervisor. In 2D, Tim Davies was Lead Flame Artist and Becky Porter, Lead Nuke Artist. We tackled Chevy 'Busted' at the highest level with some serious VFX muscle." The Mill saw the alien-themed spot through telecine, with Adam Scott, Head of Telecine, handling the grade. He notes, "I enjoyed working closely with Felipe [Lima], the art director, before Christmas. We set a cool nighttime environment against the bright garage interior. I was amazed to see the aliens and master graded to give more shape and depth to the finished project." All the creative synergy pays off, driving home the end tag that Chevy Volts are the "coolest cars on the block with the smartest technology in the galaxy."